I’ve got 5 ways to dress up t-shirts for you, friends. If you’re anything like me, you probably love your comfy t-shirts and you probably have a tee in every color and shape–scoop neck, v-neck, crew- neck, etc. Alas, the good old plain t-shirt and jeans gets pretty old, pretty fast. 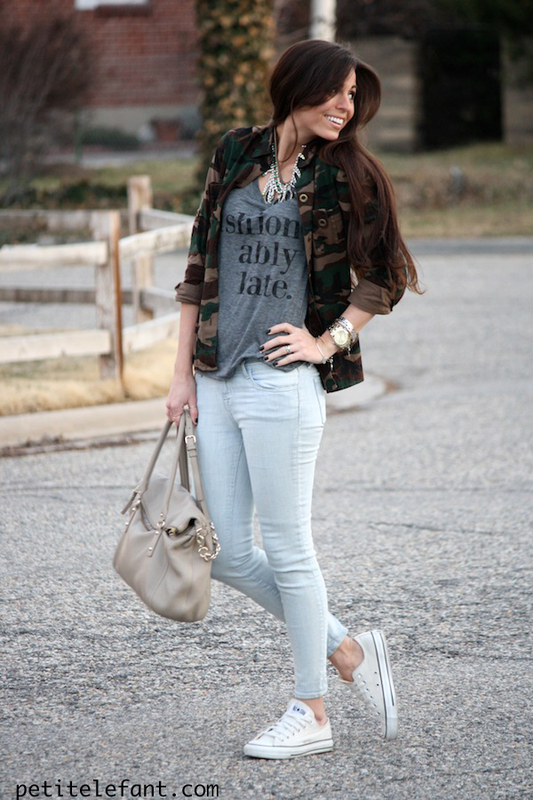 I find myself gravitating to a white v-neck and comfy jeans almost daily, but like to jazz up the look! Here are my favorite ways to dress up t-shirts for any occasion. Pair it with a fun skirt, bright accessories- or both! Some of my favorite outfits have been a mixture of casual pieces with slightly dressier pieces. You may usually wear a pencil skirt with a chiffon top or button down, but why not pair it with a fun t-shirt?! This will definitely dress up the t shirt without being fussy or fancy, great for brunch or a date night. Play it up with other prints! A grey tee by itself looks fine, but when you throw a fun camo, chambray or striped blazer over your it, there’s a whole new look in play. Throw on a pair of skinny jeans and adorable flats for a look that is beyond basic. Lastly, throw a comfy cardigan over it and call it a day! It is an easy go-to look, but always look chic and comfortable! A chunky draped cardigan goes a long way and keeps your look functional and relaxed, yet still livening up your plain tee! And, now you know, it doesn’t take much to dress up t-shirts, and rock some great spring style. Make sure to check out my blog – www.cleverlyours.com for more of my outfit ideas! You are looking pretty. Third one is best with grey tee, blue jean, dressier clutch and heels. Thanks for sharing your good and lovely ideas about comfort dress up.